Welcome to Aging Out of Place. We’ll be talking to seniors who’ve said no to aging in place and yes to digging up roots and replanting themselves someplace cheaper, warmer or easier. Or all three. Carol Merchasin and her husband Robert are planning on living a long time… a really long time. Now 68 and 69, they’re banking on being blessed with their mothers’ longevity genes; her mother is 93 and his is 102. That’s why, when the Merchasin’s turned 60, they started wondering how they could avoid touching their nest egg for at least another decade. The answer: move to Mexico. It was close enough for Carol to easily travel to the U.S. for occasional consulting jobs (she’s a former lawyer who does workplace trainings), and the lower cost of living would allow them to support themselves into their 70’s by working only part time. After closing their home near Boston, the Merchasin’s made the move and now spend the greater part of the year in the colonial mountain town of San Miguel de Allende in central Mexico. 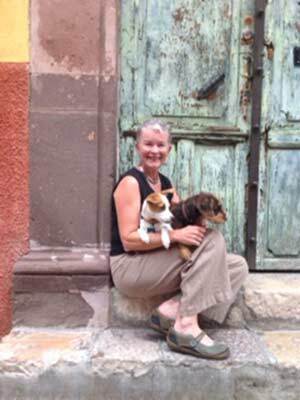 We spoke with Carol about life as a senior expat in San Miguel. What is the best thing about living in San Miguel? I love the people, the culture, and the pace of life. There is a civility and a kindness among the Mexican people that is extraordinary. And, of course, it doesn’t hurt that the weather is wonderful, the town in completely walkable and the architecture is stunningly beautiful. It leads to a very satisfying pace of life. When we got here, we fell in love. We had planned to visit different colonial towns, but we were in San Miguel maybe eight days when we bought the house we still live in. Ours is a very San Miguel story. People come and they either never leave or they go home just to pack up their entire lives and come back. Dealing with the bureaucracy. It’s not efficient and also a bit abusive. It took me seven trips to get my visa. I misplaced one of the papers I needed and found there was no easy solution. Robert had to go to several different agencies to register to pay our taxes. That’s partly because the right hand of the bureaucracy often doesn’t know what the left hand is doing. San Miguel is a popular tourist destination, but what do expats do who live there full time? We live our lives in San Miguel very much like we would anywhere – quietly and slowly. Robert and I work in the mornings, and in the afternoons and evenings, we might go to the library, sit in the Jardin [the town square] and people watch, have a coffee with friends, go to the movies or out to eat. For those who are more social, the presence of a large expat community means there’s is much to do, from yoga to Zumba, golf, tennis, art classes, bridge groups, meditation centers and a wonderful Lifelong Learning program with interesting courses. There are also 82 non-governmental organizations in San Miguel, so there are many volunteer opportunities for those who want to help the community. The extraordinary number of activities makes it good for single seniors, too. How is the health care? We still have our Medicare to use in the U.S. but we both have been in hospitals in Mexico. My husband had retinal surgery, and I had an angioplasty here. The hospitals are very modern, and the doctors never seem rushed. We had to pay for the operations, but the cost is about 80 percent less than in the U.S.
We also have Medevac insurance [medical evacuation insurance] for emergency evacuation to the U.S.
What has “aging out of place” meant to you? In San Miguel we found a life that was not available in the U.S. at any price. I have more time, more autonomy, a year-round good climate and the Internet. And Mexico’s proximity to the U.S. allows us to return to visit our family. We go for five weeks over the Christmas holidays to visit our son and my mother. Robert goes back several times a year to visit his mother. When we first moved, I went back to work about 10 times a year for two or three days. Now that I’m writing, I’ve taken on only one consulting project. It means living with some kind of purpose, something that wakes you up in the morning and carries you through the days, months and years. I want to be as engaged in my life in my 70s, 80s and beyond as I was in my 20s and 30s. I want to have some intention about this last wonderful part of my life. Cost of housing: Pricey San Miguel is more expensive than other places in Mexico, and houses in the historic district are pricier than those further out of town. “It is possible to rent a house in San Miguel for $500 a month,” Carol says, “but it’s not going to be renovated and not in the town center.” Prices go up from there to several thousand a month. Crime scene: No worries I’ve never been robbed or mugged or been the victim of any crime here,” Carol says. Expat community: Emerging-plus It’s beyond ‘emerging’ but expats are not taking over. Because of the large number of expats and tourists, many people speak some English. An English language newspaper, Attención, provides a calendar of events, and a website, SanMiguelEvents, lists the week’s art openings, concerts, workshops, lectures, and festivals. Taxes According to this site, an expat doing business online/by phone with a foreign company and paid in non-Mexican currency is not taxed on that income. American Social Security benefits and pensions are not taxable in Mexico. Discounts INAPAM, Mexico’s discount card for seniors 60-plus (must be resident of Mexico) is honored by many establishments – retail, travel, dining, cultural – and also by some municipal water and gas authorities. Discounts range from 10 to 50 percent. Climate Temperate: The lows seldom fall much below 60 F, and the highs are in the 70s and 80s. July and August can be rainy. Civil rights There’s a history of serious abuses – killings, disappearances and torture – by security forces fighting organized crime and drug trafficking (primarily in the north). Corruption is rampant in the police force. Sexual crimes, and hate crimes against LGBT people, often are not prosecuted. Best places to stay If you want to check out San Miguel, Carol suggests these B&Bs: Casaluna, Posada Corazon, Antigua Capilla, and La Mansion del Bosque. VRBO has a number of apartments and houses for rent, too, including the Merchasin’s Cinco Flores. Is there any possibility of meeting you in person when I, my husband and adult son are in San Miguel May 5th through May 14th? It’s a lot to ask but I’m 99.9% on board to relocate from Washington DC this year. I have contacted a real estate agent but if you have a favorite I would love a name. I have had no luck getting any word back from Agave agents. Maybe ‘ancients’ aren’t their thing. I would also so appreciate a referral to someone who could guide us through all the red tape that is required. Your name was given to me by Patricia Ullman ( I think you might have known her by another name when she was married) . She was a member of Buddhist community that your husband participated in. Please offer advice re: a 75 year old but youthful , fit single woman moving to SMA. Good idea or bad? I’m kinda new to this, trying to understand. If you’re an American living in MX full time…you can keep your USA citizenship, and get SS benefits (are these deposited to US banks and you have to file USA taxes right). Then, you move money from USA to MX when u need it? Also, stuff like Medicare. how does that work? you pay into a MX insurance system and get MX healthcare, but if you retain USA citizenship you can fly back to USA and use medicare? This is an interesting article and tempting for me to begin to consider moving there until I read online about their water quality. Water is Life as they say and, after reading about water there, that ended it for me. (Too bad!) I also read an article from a man, a gringo who speaks Spanish and has lived for some years in a nearby city, who has observed directly on multiple occasions Americans having an arrogant and prejudicial attitude towards the local people. This was very sad to hear. He also mentioned that this is not talked about or, when he brings it up to other Americans, there is much denial and anger and statements confirming to him the objectification of the peoples there. So, to all who venture forth watch attitudes of entitlement and superiority please. We went to San Miguel De Allende in October of 2016. We loved it. I especially thought the people were so kind to me. I loved not having to drive, just take a taxi everywhere or walk which we did a lot of. I live in Houston and hate the traffic and the road rage incidents. People drive like jerks, and nearly everyone carries a gun like their Marshall Matt Dillion and shootings nearly everyday. I would like to know the procedures to move to SMA, involving visa’s, etc. My only drawback was I don’t speak Spanish, so I am studying to learn so when we go back this coming May, I will be able to talk to the community. Please give me some advice and tips. There are a lot of jerky drivers in Mexico too. You just have to be quite vigilant. Good luck. it is not as easy as they make it sound. but very doable.. Things move more slowly in Mexico to so take your time and do your research. Well that is just awful. Hey, nice blog guys. Btw, I am curious. A tennis buddy and I (we’re both married guys) are bringing two senior single guys (60 and 70) down there for a guys-just-hanging-out kind of week later in the month. What watering holes or coffee shops or forums or whatnot can I point them to where they might find some female companionship during the evening hours. U.S., British, Canadian, professional (not in that sense. please), They should be 55-plus. Interesting dinner party people, in other words. We’re an academic, a writer/investor, an engineer, with a place in Centro, and a 6’4 Norwegian former male model. Seriously. All of us are Seattle-based. Drop us a line at nickravo@mac.com if you have any advice. I don’t know who told you that the temperature lows rarely fall below 60 – at night from November – February, it will certainly be low 40s and sometimes below freezing. Please do your research. Once they talked about the weather not going below 60- and not talking about the hilly, difficult to walk cobblestone streets, they lost some creds, A bit too rosy. Our winter temperatures commonly fall into the 30’s in the winter time. December til mid-February. I’ve lived here 14 years and often leave for that length of time, Without central heat and living in stone houses, it can often be 50 INSIDE your house! The INAPAM card is basically for meds, and travel. I’ve never found a restaurant or retail store that will discount with the card. Thanks for the article. I write a blog at babsofsanmiguel.blogspot.com about life and life in Mexico with about 30,000 readers a month. Check it out!